The Extreme Citizen Science group, set up about 8 years ago, has developed two main technological infrastructures – Sapelli software to allow data collection by low-literacy participants, and GeoKey, a data management system for community mapping. We have also developed an engagement approach that allows for the co-production of the data collection process, and for sharing of the information in a culturally sensitive and ethical way. These developments were funded by the Engineering and Physical Sciences Research Council (EPSRC). We now have funding to grow these activities (and in particular the use of Sapelli) into a social enterprise, and we’re looking for a consultant (who will be encouraged to apply for the post of director once the organisation is set up). We have £40,000 to enable the consultant to dedicate themselves to develop the organisation over a year and a bit. UCL’s Extreme Citizen Science (ExCiteS) group has recently been awarded EPSRC Impact Acceleration funding from the “Discovery To Use” initiative at UCL. The funding has been awarded to launch a social enterprise – the ExCiteS Social Enterprise (or ESE), via the Accelerated Market Entry and Upgrade project (AcuMEn). This tender represents one of several work packages to help launch this process. Each work package (see below) will be tendered separately. Extreme Citizen Science (ExCiteS) is a situated, bottom-up practice that takes into account local needs, practices and culture and works with broad networks of people to design and build new devices and knowledge creation processes that can transform the world. Over the last decade, ExCiteS has worked with indigenous and traditional communities in Cameroon, the Congos (RoC and DRC), Central African Republic, Ghana, the Brazilian Amazon, and Namibia on a range of projects – be it using participatory mapping to combat illegal resource extraction or invasions (often in the context of logging and poaching), or to monitor wildlife populations or a community’s territorial boundaries. This work supports environmental justice and strengthens conservation efforts as well as promoting and protecting the rights of these often vulnerable communities who sometimes live under the constant threat of exploitation and violence. Our custom-developed mobile data gathering platform called Sapelli supports rapid adaptation to local conditions in the field through our unique approach that centres on participatory design with non-literate, non-technologically familiar users – developing locally-specific configurations of Sapelli to address problems identified by the community. Over the last 10 years we have carefully honed our methodology based on the Free and Prior Informed Consent (FPIC) of participants into the development of a clear Community Protocol (CP) for the use of the technology and the data that is collected with it. These methodological approaches are integral to the successful application of the technologies we have developed. The purpose of the AcUMEn project is to transform research collateral (the technologies and know-how) of the Extreme Citizen Science (ExCiteS) research group into a set of commercially viable yet socially focused offerings in what we will describe as the ExCiteS Social Enterprise (ESE). We have reached a point of maturity with our tools and methods whereby we are able to transpose these research projects into a standardised approach suitable for various forms of service delivery. Whilst this is workable in a research context, they are barriers to usability when positioning it as a commercial proposition. This project is designed to remove those barriers, to establish a core operating model and branding, a clear set of commercial offerings supported by a clear business strategy, and to obtain an initial tranche of work. WP 1: Secure initial funding for contracts, consolidate project delivery approach and build initial team, as well as control WP 2 and WP 3 in consultation with UCL ExCiteS. Towards the end of 2019, the role of a permanent director will be advertised via an open application process. WP 2: Hire expert social enterprise consultants to develop a clear commercial strategy and 18-month roadmap in line with ExCiteS’ ethos of social responsibility and collaboration. WP 3: Software consultancy to deliver key improvements to Sapelli, the mobile data gathering platform developed by the group through the last decade of research. Please note that the exact constitution of the other work packages may be subject to change, depending on how this first phase of work proceeds. Posted on 25 January, 2019 25 January, 2019 Categories Citizen Science, Extreme Citizen Science, GIS, Social Enterprise, UCL KTTags Extreme Citizen Science, Social Enterprise, social entrepreneurshipLeave a comment on Opportunity: come and help us create the ExCiteS Social Enterprise! 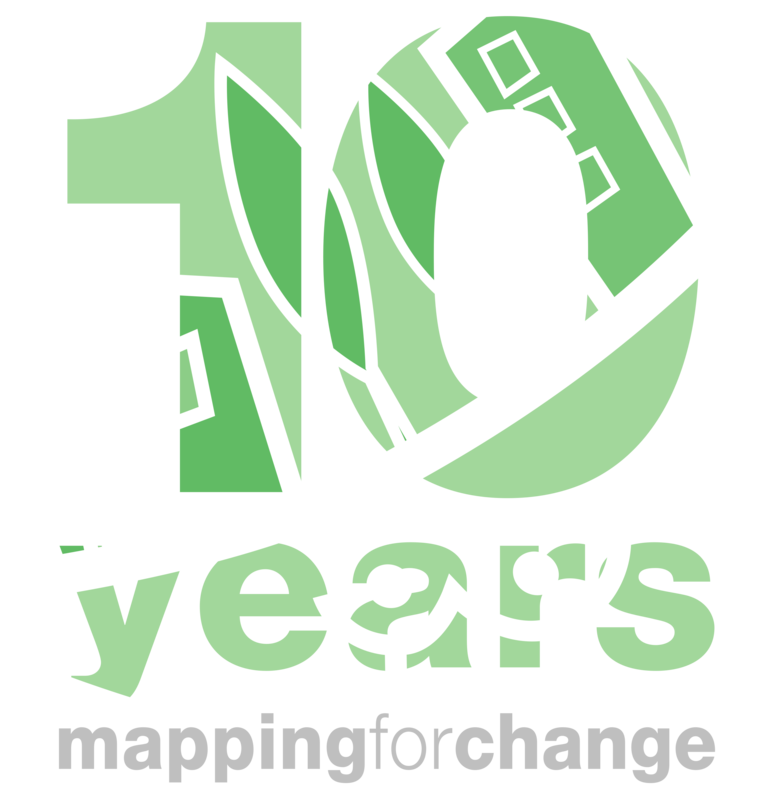 November 24 marks 10 years since Louise Francs, Chris Church and myself set up Mapping for Change. It’s a proud moment when the social enterprise that was set out of a research project at UCL is now well established, and the work that it does is mentioned in the annual report of the Chief Medical Officer, appear in the Guardian, and develop projects in many places far from its origin in London – including in Barcelona, Katowice, Valletta, and Kampala. Mapping for Change came out of the Higher Education Innovation Fund (HEIF) funded “Mapping Change for Sustainable Communities“. Originally, we’ve approached Steve Coast and Nick Black to develop a community mapping platform, but they got busy with CloudMade and we were lucky that Claire Ellul stepped forward and developed the first version of the community mapping platform during her postdoctoral research. Claire is our unofficial co-founder and acted as technical lead for a long while. Mapping Change for Sustainable Communities was about to end in December 2008, and Louise, Chris and myself decided that we’re going to continue to utilise the platform and engagement methodologies that we’ve developed through a new organisation, so we set up Mapping for Change for this purpose. 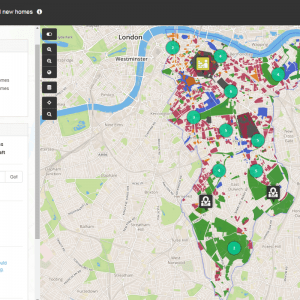 Originally, Mapping for Change was supposed to be set as a collaboration between London 21 Sustainability Network and UCL, but with the demise of London 21 in 2010, UCL became the main owner of it. 2008 – the basis for Mapping for Change was an extensive set of workshops that were carried out in different areas in East London. The image is taken from a workshop at Hackney week in March 2008, which was eventually digitised and shared on the new community mapping platform – and in this image both Louise Francis and her London 21 colleague, Colleen Whitaker, leading a participatory mapping workshop. 2009 – With the first brochure and also a description of existing activities, we started securing the first projects that were paid for. These included working with different faith communities across London on sustainability issues, and also a map of food growing in Brixton (linked to the Transition Town group there). Another project started at the time was with UCL Development Planning Unit around Hackney Marshes. 2010 – the official launch of Mapping for Change at UCL included an endorsement from Steve Caddick, the Vice Provost for Enterprise (in the picture on the right). We have also started working with UCL Public Engagement Unit on understanding the relationships between UCL and the local community that live around it. Most importantly, we have secured a social enterprise award from UnLtd, as part of their programme to support social enterprises in Universities. 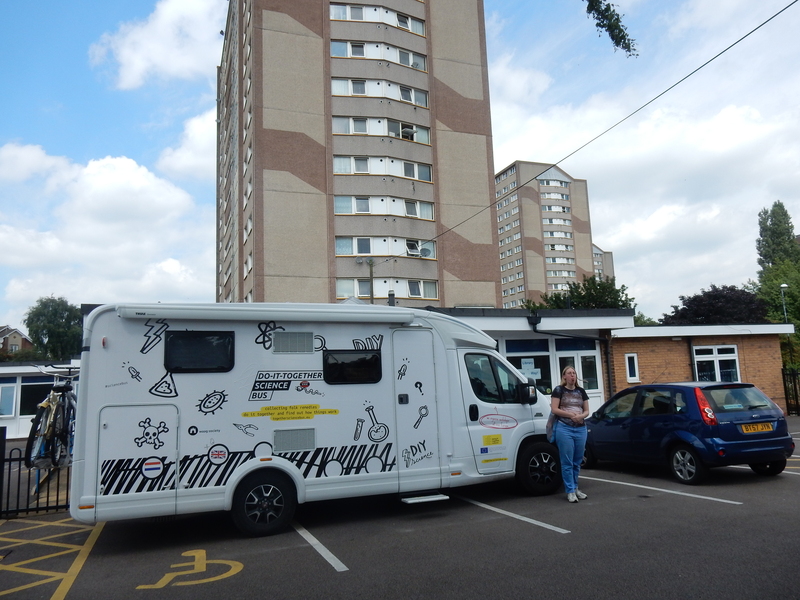 We also started to carry out air quality study in the Pepys Estate. Some of our work was covered in GIS Development. 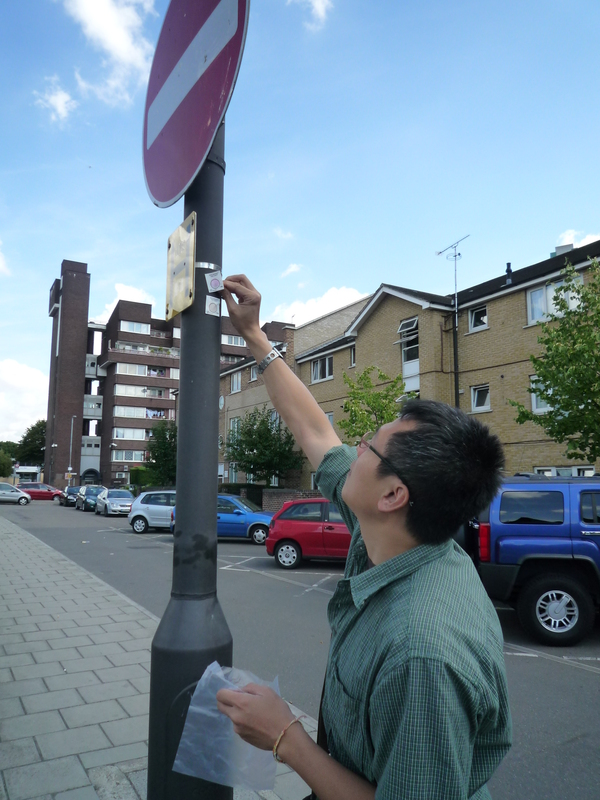 2011 – the work on community-led air quality monitoring started to expand, with studies in Highbury and Islington. We also carried out work on mapping activities in canals and waterways and helped The Conservation Volunteers to assess their impact. As a UCL champion for social enterprise, it was possible to encourage the institution to support activities such as those of Mapping for Change in a more organised way. 2012 – the main change to the company in this year happened with the help of UCL Business, the technology transfer office of UCL (and in particular Ana Lemmo). We changed the registration to a Community Interest Company (CIC) and also made UCL the owner of the company, which made it the first CIC that is completely owned by the university. 2013 – following the transition to UCL ownership, we were selected as the social enterprise of the year. We also launched the Science in the City project in the Barbican – a year-long air pollution monitoring study in the Barbican estate in the City of London. 2014 – Mapping for Change was used for an Impact Case Study in the research evaluation framework (REF) exercise that year. This required explaining the work that was developed in the first 5 years of operation, and in particular air quality studies. During this year, we’ve hosted Karen Martin, who carried out a participatory mapping project with people who use foodbanks (see her slides below). During this year, we also secure the first major EU research funding for our work, through the CAP4Access project, as well as UCL Street Mobility project. At the end of the year, the new database system for managing community mapping – GeoKey – was released by UCL ExCiteS and form the basis for a new Community Mapping system. 2015 – we have started collaborating with the Engineering Exchange at UCL, and provided training in participatory and community mapping. We also released the new community mapping system – updating and replacing the software that was used from 2008. This was an extensive effort that required significant investment. The new system facilitated the creation of maps for different clients – it was possible to create a bespoke front page for Eco21 in Poland and other organisations. 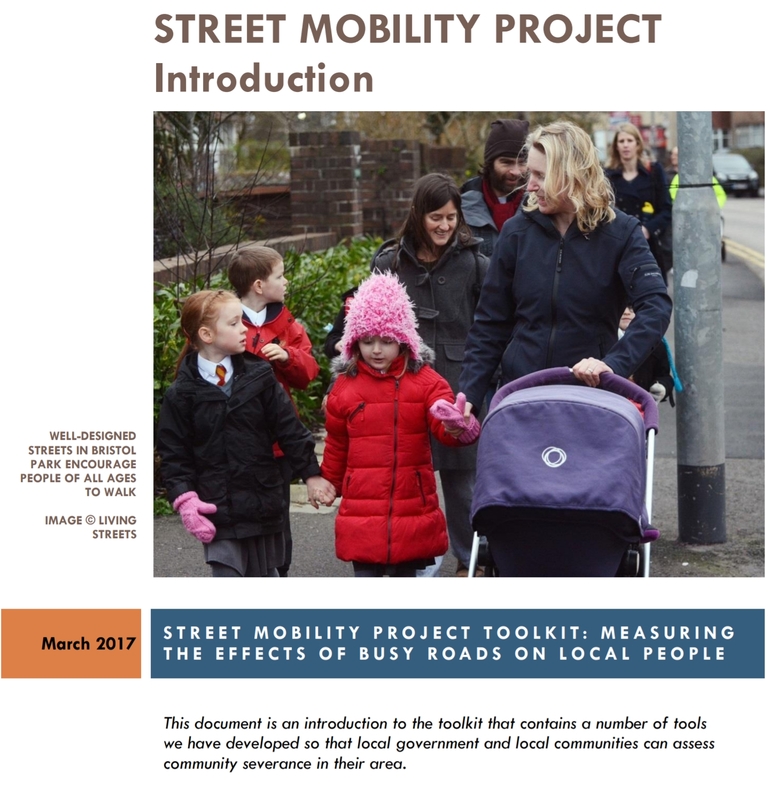 At the end of the year, we carried out a crowdfunding campaign to raise funding to support community-led air quality projects (see also here). We also helped the London Borough of Southwark to carry out a consultation on its development plan. You can also find notes from a talk at the Building Centre on Mapping for Change activities. 2016 – the year started with the launch of a new Horizon2020 project, WeGovNow! which is now its last stages. With the growing concern by the communities around UCL on the health impacts of HS2 development, we collaborated with a visiting researcher (Irene Eleta) on understanding the interactions between researchers and communities on air quality projects. We also had our first contract with the University of Malta and providing them with a platform for community mapping that they can use for different projects. 2017 – 10 years after it was originally developed, the participatory methodology that we use is published in the Routledge book of Environmental Justice, another major change happened in the late part of the year, with the office of Mapping for Change relocating to Mildmay Community Centre in Islington. This was, in some way, a close of a circle, since in 2008 when we just started, working with the project Citizens Science for Sustainability (SuScit) which was running in Mildmay was considering the use of community maps, and in 2012 Cindy Regalado carried out one of her playshops in the community centre as part of her research in ExCiteS. 2018 – Mapping for Change is now well established, and running multiple projects – maintaining the online maps, participating in Horizon 2020 projects – a new one, D-Noses, just begun, and being invited to participate in tenders and proposals. Nowadays, I actually know that I don’t know about many of the interesting projects that are happening. It operates in synergy with the work of the UCL Extreme Citizen Science group and continues to grow. It is a successful example of a knowledge-based social enterprise. There were many people that helped Mapping for Change, worked or volunteered on the many projects that were carried out over the years – and this is an opportunity to thank all of them! During the 22 to 29 October, I visited Shanghai & Shenzhen together with Michael Norton (CIVA), who organised the visit, and Liz Barry (Public Lab). This was a packed tour, with two all-day workshops that are dedicated to citizen science (one in Fudan University, Shanghai, and the other as part of the Asian Environmental Innovation Forum (AEIF) 2018 in Shenzhen at the Open FIESTA facility in Shenzhen), talks and visits to social enterprise hubs and social innovation activities, as well as participation in the Asian Environmental Innovation forum. This was my first visit to China, and as a result, it was an overwhelming experience – with a lot of things to try to make sense of, such as considerations for cultural practices (in other words, trying not to offend anyone unknowingly), or how the internet and mobile applications are experienced within the Great Firewall. This post is about some of the things that I’ve noticed during this visit. Despite the fact that the three of us are focused on community action, the workshops and talks were designed as a general introduction to the area of citizen science, highlighting the potential for participation that is suitable for people who want to do something with little time investment, all the way to the DIY science approach that Public Lab promotes and dedicate significant time to such an activity. We also emphasised the link between getting involved in an activity as part of a wider awareness and actions that address social and environmental challenges. In the workshops, we started with an introduction to citizen science (me), followed by a talk on the ethos and activities of Public Lab (Liz), and finally about the use of information and insight for action (Michael). Next, we designed a session in which participants could experience different types of activities – from using two Zooniverse projects – the Wildes’ Wildlife Watch and Snapshot Serengeti, which provide different complexity in wildlife classification; A second group used their phones to install soundscape monitoring apps – the Chineses-based Participatory Soundscape Sensing using the SPL Meter app, and the German-based HushCity with the HushCity app. The participants downloaded and registered in class (only HushCity require registration), and then went out to collect information for about 10 minutes; A third group build the Public Lab DIY microscope and examined water taken from a local river; The last group focused on balloon mapping, which was the most involved task, culminating in all workshop participants going outside for an aerial selfie. We have repeated the session twice, and allowing people to experience two areas of activities. Finally, there was a group work, on developing ideas on how to address plastic pollution with the help of citizen science. The workshop in Fudan attracted about 35 participants, while 60 came to the one at Open FIESTA. In both cases, there were many students (with more postgraduate students in Fudan) as well as people from NGOs and civil society organisations. We also had a talk with about 10 people present and many more online through webcasting at Bottledream office which is an online network for social innovation and change makers, and a talk to about 30 people, many of them expat who live and work in Shanghai at Green Initiatives. Across the workshops and the talks, it was a pleasure to receive questions that were insightful and show real engagement with the potential of citizen science. The “data quality monster” (or should it be a dragon?) was dormant most of the time, although the second common question on motivations and reasons for participation did appear. I was asked several times about the inclusion of game elements and competition in citizen science project as a way to increase participation, and I pointed to the challenges that such an approach requires (dealing with cheating to score points, short engagement cycles etc.). There was a good question about the ownership of data and images and the intellectual property rights from a law student, and another one about ethics and the way in which consent is being secured in citizen science. Another valuable question was about the implications of Machine Learning (AI) on citizen science. People also asked about a specific area of application – e.g about projects that deal with coastal and marine issues. At the Bottledream talk, we explored the potential for social enterprise and investment in the area of citizen science. Finally, and not surprisingly, in each talk and workshop, the issue of collaboration with officials and the potential conflict in government did appear, with a lively discussion about different types of citizen science – those that are about helping progressing scientific knowledge vs. projects that are more aimed at civil action, and how to navigate these challenges based on our experience. Technically, the Great Firewall helped in demonstrating the need for adapting apps and IT infrastructure to specific contexts – especially in view of the global initiatives for citizen science which must include China. Oddly, Zooniverse website was accessible in some networks (e.g. Fudan University), but in other places – though it was mostly accessible if somewhat slow. But the issue with access especially stood out in the soundscape mapping. The SPL Meter app was easy to set up, and the results could be shown on the website and thus providing the all-important immediate feedback. HushCity (leftmost screenshot) could not show the information because it rely on Google Maps as background – which is also not available in China (middle). In contrast, I could demonstrate Mapping for Change community maps, because it relies on MapBox tiles, which are available in China. This, turn out, is not solving the whole problem, there is also the issue that China is using a different datum for its maps, which in plain language mean that there is a GPS shift that needs to be taken into account. There is a clear interest to share knowledge and best practice beyond the challenges of accessing a specific platform. There is also the issue of language. Hopefully, resources in citizen science can be shared by CitizenScience.asia and or the Open FIESTA. Another insight was provided by the very different “app ecosystem” in China. Because of the ubiquity of WeChat (equivalent to WhatsApp), which also have the ability of add-ons (which WhatsApp doesn’t), there is a whole range of applications that are possible which combine the intimacy of contact in a managed group with the ability to do more things. I learned about three applications which are relevant to citizen science. First Respond is a Chinese social business that provides first aid support for large public events – such as marathons. As part of the work with their volunteers, they organised crowdsourced mapping and checking of AED (Automatic Defiblerator) in which volunteers verify the location and preparedness of AED across a large area. Another example is the Sengo organisation of environmental volunteers who use WeChat to report river pollution incidents. Finally, the volunteer cleaning effort fo PickUpChina was using an app to record places that need a cleaning effort, and getting people to join and carry out a cleaning day. The Sustainable Development Goals (SDGs) were recurring theme throughout the visit at both social innovation spaces and universities – in the Impact Hub in Shanghai they are prominent, and at the workshops and the AEIF conference, they were mentioned frequently as a framing for education, social innovation, the wider regional support in the region (e.g. Laos, Cambodia), and also in thinking about the opportunity for citizen science. Thinking again about global initiatives, there is a need to link them to the SDGs since although they are not high on the agenda in say, the UK, they are a common language (as Liz describe them) between initiatives. In addition to the SDGs, litter and addressing the challenges of plastic pollution was a recurring theme, and we have used it in the workshops as a final exercise, in which participants were split into 3 or 4 groups – government, industry, consumers, and young students (in the second workshop). The discussion between the group was lively (we asked them to discuss in Chinese), and it was clearly an issue that raises concern and interest to address it. The social enterprise activities were also impressive in their ambition and content – from meeting Shiyin Cai, the founder of Dialogue in the Dark which provides an encounter with blindness for people who can see, to hearing from Xia Li, who founded Shenzhen Power Solution Ind who is committed to providing lighting and energy to “bottom of the pyramid” people, or Songqiao Yao, who founded Wildbound to link young people in China to global environmental issues. Visiting the two incubators in Shanghai – the Impact Hub, but also 724 Cheers Hub – was fascinating and educating. The final note is that looking at the participants during the hands-on session was delightful. As Michael pointed to them during the feedback session at the end of their experiences, they looked interested and engaged in trying and experimenting like “someone who is 9 years old“. Indeed, there was an active learning that was apparent in every stage, but especially during the flying of the balloons. The flying of the balloons to take a picture of the participants create a “focal practice” that brings people together, make them focus on the communal activity, and bring meaning to technological design and implementation. The level of enthusiasm across the meetings and workshops was very high, with students giving up their weekend, or professional giving up a workday to attend an event. There was also a lot of generosity and help in working through language differences, helping to navigate the city, running a group at the workshops, or volunteering to translate a discussion. I was continuously grateful to all the lovely people that we met and talked with. 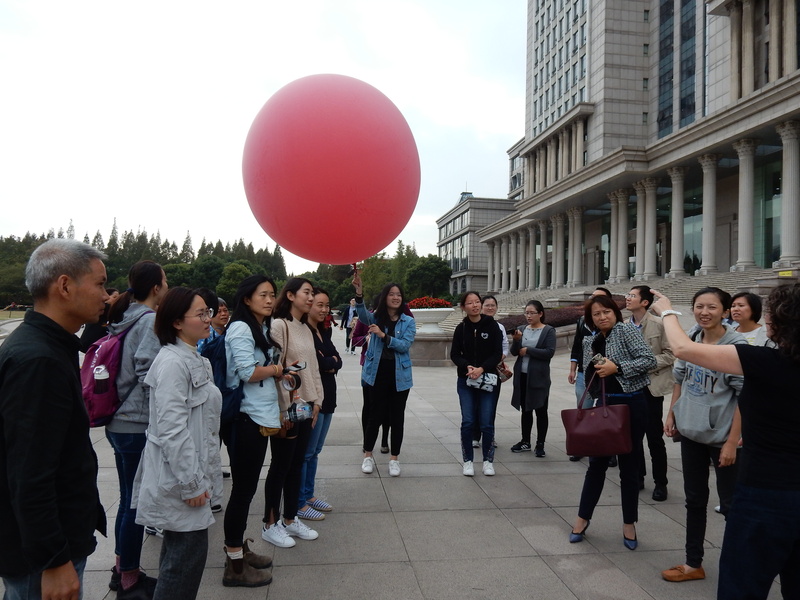 Below you can see the “balloon selfie” from the Shenzhen workshop. 1. What are the desirable (shorter-term) outputs and (longer-term) impacts that we expect from Open Science and what are potential downsides? 2. How can scientists and institutions be incentivised to produce these desirable outcomes and manage the downsides? The session that I was asked to contribute to focused on Societal Engagement: “The third pillar of Open Science is societal engagement. Ensuring open access to scientific information and data, as considered in the previous sessions, is one way of enabling societal engagement in science. Greater access to the outputs of public research for firms is expected to promote innovation. However, engaging with civil society more broadly to co-design and co-produce research, which is seen as essential to addressing many societal challenges, will almost certainly require more pro-active approaches. Incentivising and measuring science’s engagement with society is a complex area that ranges across the different stages of the scientific process, from co-design of science agendas and citizen science through to education and outreach. There are many different ways in which scientists and scientific institutions engage with different societal actors to informing decision-making and policy development at multiple scales. Assessing the impact of such engagement is difficult and is highly context and time-dependent“. “What do we desire in terms of short and long-term outputs and impacts from societal engagement? How can various aspect of scientific engagement be incentivised and monitored? What are the necessary skills and competencies for ‘citizen scientists’ and how can they be developed and rewarded? How does open science contribute to accountability and trust? In my talk, I’ve decided to address the first three questions, by reflecting on my personal experience (so the story of a researcher trying to balance the “excellence” concepts and “societal engagement”), then consider the experience of the participants in citizen science projects, and finally the institutional perspective. I’ve started my presentation [Slide 3] with my early experiences in public engagement with environmental information (and participants interest in creating environmental information) during my PhD research, 20 years ago. This was a piece of research that set me on the path of societal engagement, and open science – for example, the data that we were showing was not accessible to the general public at the time, and I was investigating how the processes that follow the Aarhus convention and use of digital mapping information in GIS can increase public engagement in decision making. This research received a small amount of funding from UCL, and later from ESRC, but not significantly. I then secured an academic position in 2001, and it took to 2006 [Slide 4] to develop new systems – for example, this London Green Map was developed shortly after Google Maps API became available, and while this is one of the first participatory GIS applications on to of this novel API, this was inherently unfunded (and was done as an MSc project). Most of my funded work at this early stage of my career had no link to participatory mapping and citizen science. This was also true for the research into OpenStreetMap [Slide 5], which started around 2005, and apart from a small grant from the Royal Geographical Society, was not part of the main funding that I secured during the period. The first significant funding specifically for my work came in 2007-8, about 6 years into my academic career [Slide 6]. Importantly, it came because the people who organised a bid for the Higher Education Innovation Fund (HEIF), realised that they are weak in the area of community engagement and the work that I was doing in participatory mapping fit into their plans. This became a pattern, where people approach with a “community engagement problem” – so there is here a signal that awareness to societal engagement started to grow, but in terms of the budget and place in the projects, it was at the edge of the planning process. By 2009, the investment led to the development of a community mapping system [Slide 7] and the creation of Mapping for Change, a social enterprise that is dedicated to this area. Fast forward to today [Slide 8-10], and I’m involved in creating software for participatory mapping with non-literate participants, that support the concept of extreme citizen science. In terms of “scientific excellence”, this development, towards creating a mapping system that anyone, regardless of literacy can use [Slide 11] is funded as “challenging engineering” by EPSRC, and as “frontier research” by the ERC, showing that it is possible to completely integrated scientific excellence and societal engagement – answering the “reconciling” issue in the workshop. A prototype is being used with ZSL to monitor illegal poaching in Cameroon [Slide 12], demonstrating the potential impact of such a research. It is important to demonstrate the challenges of developing societal impact by looking at the development of Mapping for Change [Slide 13]. Because it was one of the first knowledge-based social enterprises that UCL established, setting it up was not simple – despite sympathy from senior management, it didn’t easily fit within the spin-off mechanisms of the university, but by engaging in efforts to secure further funding – for example through a cross universities social enterprise initiatives – it was possible to support the cultural transformation at UCL. There are also issues with the reporting of the impact of societal engagement [Slide 14] and Mapping for Change was reported with the REF 2014 impact case studies. From the universities perspective, using these cases is attractive, however, if you recall that this research is mostly done with limited funding and resources, the reporting is an additional burden which is not coming with appropriate resources. This lack of resources is demonstrated by Horizon 2020, which with all the declarations on the importance of citizen science and societal engagement, dedicated to Science with and for Society only 0.60% of the budget [Slide 15]. We now move to look at the experience of participants in citizen science projects, pointing that we need to be careful about indicators and measurements. We start by pointing to the wide range of activities that include public engagement in science [Slide 17-18] and the need to provide people with the ability to move into deeper or lighter engagement in different life stages and interests. We also see that as we get into more deep engagement, the number of people that participate drop (this is part of participation inequality). For specific participants, we need to remember that citizen science projects are trying to achieve multiple goals – from increasing awareness to having fun, to getting good scientific data [Slide 19] – and this complicates what we are assessing in each project and the ability to have generic indicators that are true to all projects. There are also multiple learning that participants can gain from citizen science [Slide 20], including personal development, and also attraction and rejection factors that influence engagement and enquiry [Slide 21]. 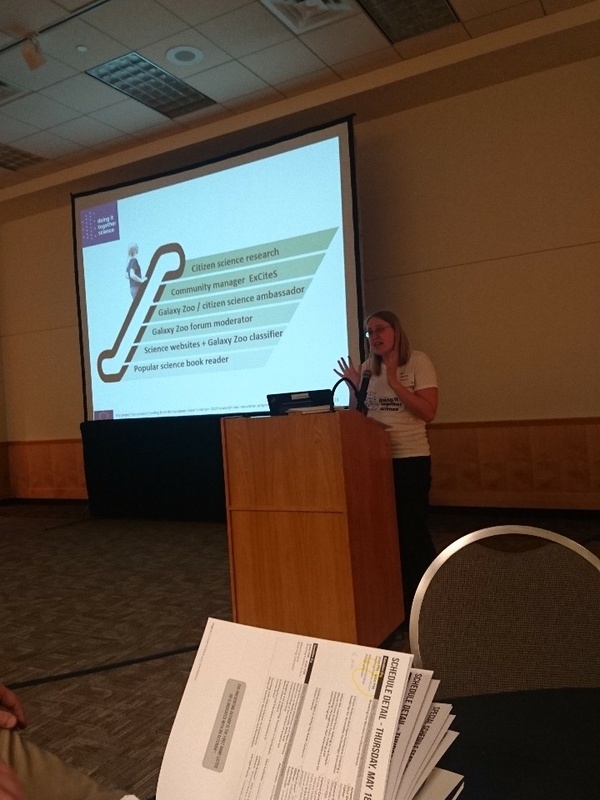 This can also be demonstrated in a personal journey – in this example Alice Sheppard’s journey from someone with interest in science to a citizen science researcher [Slide 22]. However, we should not look only at the individual participant, but also at the communal level. An example for that is provided by the noise monitoring app in the EveryAware project [Slide 23] (importantly, EveryAware was part of Future Emerging Technologies – part of the top excellence programme of EU funding). The application was used by communities around Heathrow to signal their experience and to influence future developments [Slide 24]. Another example of communal level impact is in Putney, where the work with Mapping for Change led to change in the type of buses in the area [Slide 25]. In summary [Slide 26], we need to pay attention to the multiplicity of goals, objectives, and outcomes from citizen science activities. We also need to be realistic – not everyone will become an expert, and we shouldn’t expect mass transformation. At the same time, we shouldn’t expect it not to happen and give up. It won’t happen without funding (including to participants and people who are dedicating significant time). We should also pay attention to recommendations such as those from the League of European Research Universities (LERU) report from 2016 [Slide 30]. In particular, there are recommendations to universities (such as setting a single contact point) and to funders (such as setting criteria to evaluate citizen science properly). There are various mechanisms to allow universities to provide an entry point to communities that need support. Such a mechanism is called “science shop” and provide a place where people can approach the university with an issue that concerns them and identify researchers that can work with them. Science shops require coordination and funding to the students who are doing their internships with community groups. Science shops and centres for citizen science are a critical part of opening up universities and making them more accessible [Slide 31]. Universities can also contribute to open science, open access, and citizen science through learning – such as, with a MOOC that designed to train researchers in the area of citizen science and crowdsourcing that we run at UCL [Slide 32]. In summary, we can see that citizen science is an area that is expanding rapidly. It got multifaceted aspects for researchers, participants and institutions, and care should be taken when considering how to evaluate them and how to provide indicators about them – mix methods are needed to evaluate & monitor them. There are significant challenges of recognition: as valid excellent research, to have a sustainable institutional support, and the most critical indicator – funding. The current models in which they are hardly being funded (<1% in NERC, for example) show that funders still have a journey between what they are stating and what they are doing. Reflection on the discussion: from attending the workshop and hearing about open access, open data, and citizen science, I left the discussion realising that the “societal engagement” is a very challenging aspect of the open science agenda – and citizen science practitioners should be aware of that. My impression is that with open access, as long as the payment is covered (by funder or the institution), and as long as the outlet is perceived as high quality, scientists will be happy to do so. The same can be said about open data – as long as funders are willing to cover the costs and providing mechanisms and support for skills, for example through libraries then we can potentially have progress there, too (although over protection over data by individual scientists and groups is an issue). However, citizen science is opening up challenges and fears about expertise, and perceptions about it risking current practices, societal status, etc. Especially when considering the very hierarchical nature of scientific work – at the very local level through different academic job ranking, and within a discipline with specific big names setting the agenda in a specific field. These cultural aspects are more challenging. In addition, there seem to be a misunderstanding of what citizen science is and mixing it with more traditional public engagement, plus some views that it can do fine by being integrated into existing research programmes. I would not expect to see major change without providing a clear signal through significant funding over a period of time that will indicate to scientists that the only way to unlock such funding is through societal engagement. This is not exactly a “moonshot” type funding – pursue any science that you want but open it. This might lead to the necessary cultural change. This week, together with Margaret Gold, I facilitated a strategy meeting of the European Citizen Science Association. At the moment, because a recent lecture in the Introduction to Citizen Science and Scientific Crowdsourcing course that was dedicated to environmental citizen science, the “Driving forces-Pressures-State-Impacts -Responses” (DPSIR) is in the front of my mind. In addition, next week I’ll participate in a workshop about Long-Term Socio-Ecological Research (LTSER) where I would discuss citizen science in another context where DPSIR is a common framework. However, if you are not familiar with large-scale environmental management, where it is widely used since the mid-1990s, you’re not expected to know about it. It got its critics, but continue to be considered as an important policy tool. DPSIR start by thinking about driving forces – trends or mega-trends that are influencing the ecosystem that you’re looking at. The drivers lead to specific pressures, for example, pollution or habitat fragmentation. To understand the pressures, we need to monitor and understand the state of the system – this is lots of time where citizen science and sensing data are used. Next, we can understand the potential impacts and then think of policy responses. So far, hopefully clear? You can read more about DPSIR here. I haven’t come across the use of DPSIR outside the environmental area (but maybe there is?). However, as I was thinking about it, as we prepared for the meeting, I suggested that we give it a go as a way to consider strategic actions and work for ECSA. It turns out that DPSIR is a very good tool for organisational development! It allowed us to have a 20 minutes session in which we could think about external trends, and then translate them into a concrete action. Here is an example (made up, of course, I can’t disclose details from a facilitated meeting…). I’m marking positive things, from the point of view of the organisation, as (+) and negative as (-). Let’s think of a citizen science coordination society (CitScCoSo). in terms of drivers, an example will be “increase recognition of citizen science”, as Google Trends chart shows. Next, there are the pressures which include (-) the growth in other organisations that are dedicated to citizen science and compete with CitScCoSo, which mean that it will need to work harder to maintain its position, (+) increase in requests to participate in activities, projects, meetings, talks etc which will create opportunity to raise profile and recognition. CitScCoSo current state can be that the organisation is funded for 5 more years and have a little spare capacity for other activities. The impacts can be (+) more opportunities for research funding and collaborations or, (-) demand for more office space for CitScCoSo (-) lack of IT infrastructure for internal organisational processes. Finally, all this analysis can help CitScCoSo in response – securing funding for more employees or a plan for growth. When you do that on a flipchart with 5 columns for the DPSIR element, it becomes a rapid and creative process for people to work through. Mapping for Change, the social enterprise that I co-founded, has been assisting community groups to run air quality studies for the past 5 years. During this period we have worked in 30 communities across London, carrying out studies with different tools – from collecting leaves, to examining lichens, to using diffusion tubes. We have also followed the development of low-costs sensors – for example, through participation in the AirProbe challenge EveryAware project or hosting a discussion about the early stages of the Air Quality Egg. We found out that of the simple tools that are available to anyone, and that require little training, NO2 diffusion tubes are very effective. We’ve seen them used as a good sign of the level of pollution, especially from traffic. They sense pollution from diesel vehicles. We also found that reliable equipment that can measure particulate matter known as PM2.5 (very small dust considered harmful) and other pollutants is expensive – as high as £5000 and more. Unfortunately, low-cost equipment cannot give accurate information that can be used in making a case for action. Now, after developing the methodology for working with different groups and supporting local efforts, we are launching a crowdfunding campaign to support a large scale data collection campaign using diffusion tubes, with an aim to go beyond and create an equipment library that can be used by communities – free of charge apart from disposable parts (filters) and delivery – that can be shared across London and beyond. With a community investment of £250 we will deliver 10 diffusion tubes and support the creation of a local NO2 map. There are other levels of support to the campaign – including sponsoring a specific piece of equipment. 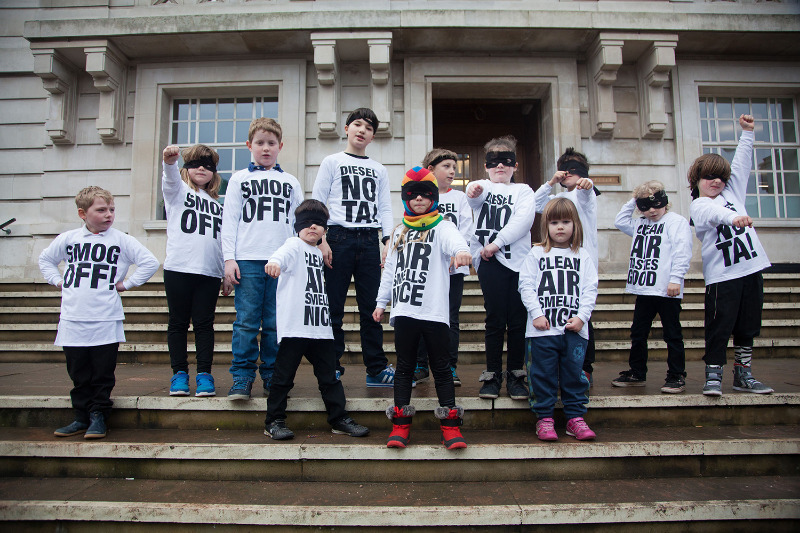 Use this opportunity and organise a local air quality map for your area!